Jacob and his mum went to visit Gran. He loved going to her house. She had a bright green budgie that she kept in a cage in her living room. It sang songs whenever Gran talked to it. She also had a whole cupboard full of chocolate biscuits. "Take these into the back garden so your mum doesn’t see," Gran said, putting a few biscuits in his hand and nudging him out the back door. She giggled and winked at him. Jacob ran to the rowan tree and sat underneath its branches, gobbling the biscuits down. When he finished, he brushed all the crumbs off his clothes onto the ground. Two tiny sparrows flew down from the leafy treetops and pecked at the crumbs. Gran’s back garden was full of pretty flowers. Jacob sniffed Gran’s roses and chased butterflies. 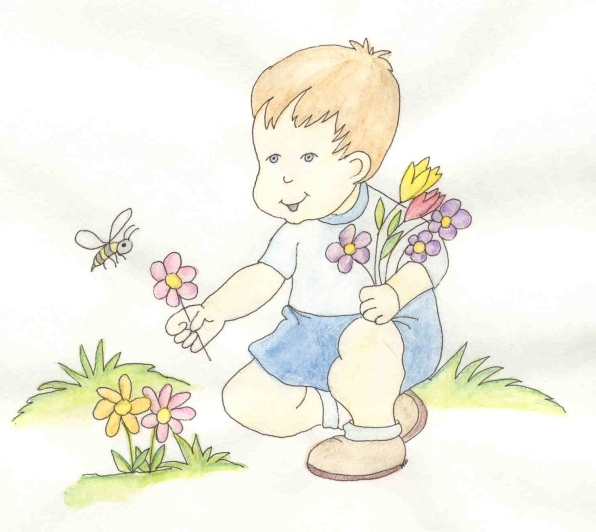 He knelt down and picked some violets, tulips, and daisies for his mum. As he was running towards the back door, he spotted a ladybug. He watched as it climbed up the ivy that grew up Gran’s house. Just then the back door opened. "What’s this?" Gran said. "You’ve picked my flowers!" She wasn’t very happy with Jacob. He began to frown. He thought she’d be happy that he’d picked them for his mum. Gran saw how sad he looked. "It’s all right, Jacob. We’ll put them in a vase and give them to your mum. They’re beautiful," she smiled. She put the flowers into a vase and filled it with water. The budgie saw them and started to sing. "Even my budgie thinks they’re beautiful," Gran laughed. Jacob carried them into his mum. "Och, they’re lovely," she smiled. After eating a big bowl of ice cream, Jacob, his mum, and Gran went for a walk in the park. It was a fun day for them all, but especially for Jacob.